A lovely sunny day with a brisk south-easterly wind making things a bit tricky out in the field; the usual spread of scarcities were across the island including a new Red-breasted Flycatcher at Nether Linnay, 8 Yellow-browed Warblers, a Common Rosefinch, two Great-spotted Woodpeckers and the Pectoral Sandpiper still. A Green Sandpiper was new along with some good duck counts with 423 Teal, 73 Pintail and 25 Tufted Ducks seen between Hooking and Brides. There were still some earlier migrants hanging on including Whinchat, Redstart, Whitethroat and Willow Warbler while there was a small increase to 8 Bramblings and 6 Chaffinches. As predicted at the end of yesterday's post the Brown Shrike did indeed reappear today, this time at Gravity but again, it showed very briefly to one observer and promptly shot off and away! A remarkably elusive and uncooperative bird which has led us all a real dance right across the island over the past few days. Scarcities through this windy day included a new Bluethroat at Westness, 13 Yellow-browed Warblers, two Great-spotted Woodpeckers (although at least one of these was a different individual to previous days) and the Pectoral Sandpiper still. There was an increase in late autumn species included 10 Song Thrush, 4 Robins, three Siskins (pretty scarce so far this autumn), at least 7 Bramblings and 10 Jack Snipe. Other little bits included the Wood Sandpiper, two Redstarts, a Ring Ouzel and 4 Garden Warblers. A misty, murky day but far nicer than the forecast had led us to believe produced a nice handful of new scarcities found across the island with the highlights being a smart 1st winter Hawfinch trapped at Holland House, a brief Richard's Pipit up at Senness and an equally brief Corncrake flushed from the iris beds around Ancum. Other new birds included a Redstart, the first Ring Ouzel of the autumn, another wave of Yellow-browed Warblers with 17 around the island and a small influx of 16 Redwings and 5 Brambling. Also of note were the lingering two Common Rosefinches, two Great-spotted Woodpeckers, Turtle Dove and Pectoral Sandpiper. There was again no sign of the Brown Shrike but judging by yesterday's antics it doesn't mean that its not lurking somewhere still. The biggest news today was the brief reappearance of the Brown Shrike from three days ago; it appeared distantly around lunchtime then instantly vanished for several hours before showing well for two or three minutes feeding on the ground in a crop and promptly disappearing again. It was then glimpsed tantalisingly in the distance a couple of times but despite a good number of people scouring the area it was never pinned down - extremely frustrating for all concerned, most un-shrike like! The rest of the day was fairly quiet with little new to reward the many hours spent slogging round the island; lingering scarcities included the two Great-spotted Woodpeckers, two Common Rosefinches still, 7 Yellow-browed Warblers and the Pectoral Sandpiper. Other little bits included a further increase to an excellent 86 Pintail - an influx second only to September 2004, two Slavonian Grebes, 4 Merlins zooming around, the Wood Sandpiper still and a new Curlew Sandpiper. Calm, clear conditions saw a bit of a clear out of yesterday's birds but there was some notable influxes especially a good count of 17 Yellow-browed Warblers mainly in the south of the island and now two Great-spotted Woodpeckers present. Other scarcities lingering included the Bluethroat, three Common Rosefinches and the almost miraculous reappearance of the Marsh Warbler which was originally ringed on the 19th and not seen since! There was a handful of common warblers scattered around along with a Black Redstart, a Tree Pipit, two Whinchats, a new Tree Sparrow at Howar and the Turtle Dove still while other bits included two Sandwich Terns, the Pectoral Sandpiper and Wood Sandpiper still and a Slavonian Grebe in Nouster Bay. Despite searching there was no sign of yesterday's Brown Shrike in the clear and sunny conditions - unfortunately perfect weather for things to move on; one of today's Yellow-browed Warblers was watched heading straight up high and away to the south towards Sanday as an example! In its place there was a good list of scarcities across the island including a Great-spotted Woodpecker near Ancum, yesterday's Bluethroat trapped at Holland, a total of 11 Yellow-browed Warblers, now three Red-breasted Flycatchers, 4 Common Rosefinches and the Pectoral Sandpiper still. There was also an increase in common migrants to 4 Whinchats, 12 Lesser Whitethroats, a Reed Warbler, two Whitethroats and 5 Willow Warblers while the Turtle Dove was still present. Other bits and pieces through the day included a good count of 59 Pintail, 11 Black-tailed Godwits, a Wood Sandpiper, two Merlins and 160 Snow Buntings. With the winds having switched round to the east everyone headed out into the field full of anticipation and confidence but like yesterday we had to wait until the afternoon for the day's highlight to turn up; this time, an intriguing Shrike was found along the dykes near Westness and with distant scope views the norm over the next few hours the combined forces of all present finally pinned down the range of features to confirm Orkney's first Brown Shrike. There was a sprinkling of other new migrants on the island including two Red-breasted Flycatchers - at the Obs and the lighthouse, a Bluethroat at Holland House, a Turtle Dove, three flava Wagtails, 8 Lesser Whitethroats, a Whitethroat and a Pied Flycatcher while the first two Redwings of the autumn and single Chaffinch and Brambling gave a more wintery feel. Two Whooper Swans and a single Barnacle Goose were with another 347 Pink-footed Geese and a Hen Harrier, two Merlins and a Peregrine cruised around. Without doubt the highlight of this wet, drizzly day was the discovery of North Ronaldsay's second River Warbler; initially flushed several times from an Iris bed near Westness giving tantalisingly brief and infrequent views it took the combined efforts of all the staff, birding visitors, a mist net and several hours before it was finally trapped and confirmed. In the hand it had extremely high fat and muscle scores weighing in at a whopping 26.9g indicating that it had been present on the isle for at least a few days. Other highlights for the island included a group of 5 Slavonian Grebes in Linklet Bay (a record island count! ), now 4 Common Rosefinches dotted around, the first Goldcrest of the autumn trapped at Holland House, a single Yellow-browed Warbler at Sandar, the long staying Pectoral Sandpiper and Little Stint, a mere 240 Pink-footed Geese today and increased counts of 13 Red-throated Divers and 24 Tufted Ducks. One of those impressive Goose days with huge, confusing flocks of Pink-footed Geese milling around with flocks coming in, heading out, turning back round north, splitting up and joining together again so the total in the log of 3,285 was probably an underestimate! Other birds though the day included counts of 94 Wheatears, 620 Meadow Pipits, 159 Snow Buntings and 8 Lapland Buntings while odds and ends included a Yellow-browed Warbler at Brides, 2 possibly 3 Common Rosefinches, a late Sand Martin, single Black Redstart and Whinchat, 7 Lesser Whitethroats and a Jack Snipe. A quiet day with the most notable event being an influx of birders to the isle who will greatly improve the coverage for the next few weeks - watch this space! There was a good afternoon passage of at least 600 Pink-footed Geese heading south today along with a high count of 536 Snipe while the Pectoral Sandpiper is still on Kirbest, one of the breeding Blue-headed Wagtails is still lingering around Ancum, a Merlin was still hassling the Snow Buntings and there were small numbers of Blackcap, Lesser Whitethroat and Willow Warblers hanging on. Another pleasant day although the wind had picked up again by late afternoon; there was actually little new picked up through the day with the first Brambling of the autumn, three Pied Flycatchers and now three Yellow-browed Warblers present. Lingering birds included the Pectoral Sandpiper still, two Little Stints, the Marsh Warbler re-trapped at Holland and an un-ringed Common Rosefinch which appeared at Holland House - which possibly could have been a new bird? It was very autumnal feeling with good numbers of Snow and Lapland Buntings dotted around with a couple of Merlins harassing them and waders and wildfowl well represented. After weeks of blazing westerly gales (it wasn't really that long but it felt like it at times!) a stunning day with hardly a breath of wind whilst being warm and sunny at the same time meant it was a joy to be out and about; long hours out in the field began with an early Little Auk and a couple of Sooty Shearwaters from the seawatch hide while a Marsh Warbler was trapped at Holland House. The rest of the day produced a few scarcities both long staying and new including a Barred Warbler walking along the beach at Nouster, two Yellow-browed Warblers, the two Common Rosefinches and the Pectoral Sandpiper still. A scattering of common migrants also included a Tree Pipit, a Whinchat, two Sedge Warblers, 4 Lesser Whitethroats and two Garden Warblers while today's odd bits and pieces consisted of an increase to 176 Snow Buntings, an excellent flock of 57 Black-tailed Godwits whizzing around, two late Sandwich Terns, two Little Stints still, two Merlin and 29 Pink-footed Geese south. Still breezy but largely dry conditions meant there was good coverage of the island today with the highlights being a Yellow-browed Warbler at Scottigar, a new Common Rosefinch which joined the long staying ringed bird at Neven (originally ringed at Holland on the 7th) and the juvenile Pectoral Sandpiper still at Kirbest. Some more typical autumn arrivals included an influx of 64 Snow Buntings, two Mealy Redpolls, the first returning Jack Snipe and a trickle of 90 Pink-footed Geese heading south. Other assorted bits and pieces comprised 11 Ruff dotted around the fields, a fine adult Grey Plover still sporting some black breeding plumage and counts of 28 Pintail and 17 Shoveler while some lingering migrants from earlier in the month included single Lesser Whitethroat, Garden Warbler, Willow Warbler and Blackcap and six Arctic Terns still hanging on off The Links. A few old favourites on 16th with the Pectoral Sandpiper still at Kirbest, the re-appearing Rosefinch at Neven and 3 Little Stints were now present. Highlights of a brief sea-watch were 17 Sooty Shearwaters and a Manx Shearwater, while a Song Thrush at Holland was new and Lapland and Snow Buntings have reached 4 each. With a strong westerly wind blowing on 17th, expectations were fairly low but with the low pressure system touching Scandinavia dragging easterly winds over the top of it there was some hope, and so it proved. There wasn't a lot but there was a little bit of quality, with a Yellow-browed Warbler at the Pier and a Bluethroat in a stubble field at Upper Breck discovered at opposite ends of the Island at the same time, with the latter showing well to the delight of the visiting tour group. The group then went one-better by scooping the 'bird of the day' prize by finding a Great Spotted Woodpecker at the Pier a short time later. Other notable sightings from the day were 5 Ruff, a Blackcap, Chaffinch, 7 Lapland Buntings and 6 Snow Buntings. The 14th was a pleasant day the highlights being the lingering Pectoral Sandpiper﻿ on Kirbest scrape, the Little Stint at the north end, a juvenile 'flava' Wagtail and the first 2 Pink-footed Geese of the year flew south. Horrendous westerly gales overnight and in the morning of 15th restricted birding attempts, but when we did get out another 14 Pink-feet passed over and perhaps unsurprisingly there were now 2 Pectoral Sandpipers-with our third juvenile of the autumn on Trolla Vatn while the usual bird remained at Kirbest all-day. At least 1 Little Stint remains, there were late singles of Arctic (Ancum) and Common Terns (Nouster bay) and a Sand Martin was at Hooking. A dazzling session overnight saw this Little Stint and a Black-tailed Godwit ﻿trapped and ringed among some of the more regularly caught Wader species. A calm day with a light westerly wind saw yet another Pectoral Sandpiper found, initially in a muddy field near Hooking it moved to the scrape at Kirbest by the afternoon. In a remarkable year for the species on North Ronaldsay this is our 6th or 7th individual (were losing count! ), with plumage differences indicating it to be a new bird from the one which lingered at Gretchen until 7th of the month. The Rosefinch was also seen again at Neven, with other notable passerines of the day being 2 Whinchats, 3 Garden Warblers, a Pied Flycatcher and 2 Lapland Buntings. The 2 Little Stints were still on the same Lochs as yesterday and a Black-tailed Godwit flew through. One of the ornithological team had a bit of luck today, when 10 minutes into a sea-watch a Great Shearwater passed by the hide at close range. A further two and half hours saw no repeat in fortunes but 36 Sooty Shearwaters, 6 Manx Shearwaters and 2 Arctic Skuas were recorded. Also today, the Rosefinch re-appeared at the north end where there were also 4 Whinchats, the first 3 Siskins of the autumn flew south and 2 Lapland Buntings were seen. Single Little Stints were on Trolla Vatn and Gretchen Lochs, a Peregrine toured the Island, 4 late Sandwich Terns were on the east coast and 8 Grey Herons included 7 which flew south. New arrivals have been fairly limited over the last couple of days-but at least we've seen some sunshine! Sea-watchers on the 8th logged 16 Sooty Shearwaters (one of which was killed by a Bonxie! ), 38 Manx Shearwaters and 7 Storm Petrels while 10 Black-tailed Godwits dropped into Gretchen briefly. On the 9th a Little Stint joined the lingering Curlew Sandpiper on Trolla Vatn, there was a Common Sandpiper at Bewan and 2 Sandwich Terns were off Hooking. Occasional passerines have been recorded the most notable of these being a Rosefinch (the bird ringed on 7th) at the Post Office and then Gravity on the latter date, when there was also a Pied Flycatcher, the odd Warbler and the first Snow Bunting of the autumn. The 6th was largely uneventful with just the lingering Pectoral and Curlew Sandpipers to report-both of which were also still present on the 7th by which time the wind had swung to a south-easterly at midday resulting in a few new passerine arrivals too. A Marsh Warbler at the Observatory and Barred Warbler at Holland were the pick of these, while a Rosefinch caught and ringed at the latter site late on was a good indicator that more may arrive tomorrow. Single Redstart and Black Redstart were also seen and the Crossbill remains at the Observatory, while a top effort by the sea-watchers saw 80 Sooty Shearwaters, 2592 Fulmars and 2332 Gannets (a record count) pass the hide in 7 hours. There was also an increase in wildfowl with 322 Wigeon and 21 Pintail most notable. A frustrating day with a couple of near-misses, but a pleasant one none-the-less in some autumn sunshine. The main cause for angst was a likely Tawny Pipit which flew over Westness calling, before being seen to land (and briefly watched at a distance on the ground) at the point only to somehow vanish into thin air! Several hours of searching failed to re-find it. There was also a promising description from a visiting birder of a Citrine Wagtail at Bewan, but this too wasn't confirmed while the American Golden Plover which came in off the sea on 3rd has also yet to be re-located. Hopefully we'll have some better luck tomorrow! There a little good news though, beginning with a Barred Warbler trapped and ringed at Holland House in the morning. 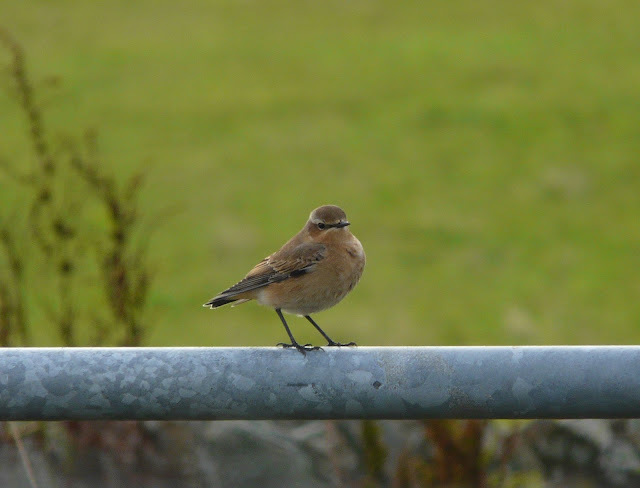 A Pied Flycatcher was also there, a Crossbill at the Observatory, 2 Lapland Buntings flew over and there was another surge of Wheatears and Meadow Pipits with 181 and 852 counted respectively. The Pectoral Sandpiper remains on Gretchen, 2 Curlew Sandpipers were at the north end and at least 2 Peregrines were seen. A rare dry day with a moderate southerly wind saw a handful of newcomers found during census along with a few lingering birds of interest. The Pectoral Sandpiper remains on Gretchen Loch and 33 Black-tailed Godwits were also present there. A Curlew Sandpiper at the north end was new, as was a Kestrel and there were now 2 Common Rosefinches-the lingering bird in the Kirbest crop and a new individual at Nether Linnay. Also of note today were a Sand Martin, Black Redstart, 118 Wheatears and a Lapland Bunting. Drizzly showers in the morning gave way to a much brighter, and more pleasant afternoon. There were plenty of waders on the move again with the highlight being a moulting adult American Golden Plover which came in off the sea in the afternoon at the Links Golf course. Searches for it this evening drew a blank but hopefully it'll be tracked down tomorrow. A juvenile Pectoral Sandpiper was at Ancum Loch in the morning and with one seen in the usual spot at Gretchen in the evening, it seems likely there are now 2 birds present. There has been an impressive passage of Black-tailed Godwits this year and at least 49 were present today along with 10 Ruff. Wildfowl included 14 Pintails, 10 Shovelers, 187 Wigeon, 213 Teal and a couple of Gadwall. There were also still plenty of Meadow Pipits around with 1025 counted, plus 177 Wheatears, a Whinchat and 3 Lapland Buntings. Meanwhile, 3 Hours of sea-watching saw 39 Sooty Shearwaters, 31 Manx Shearwaters, 12 Storm Petrels and 1415 Fulmars pass the hide. The main feature of the day which began with mist and heavy rain, forcing census back to the afternoon was a very large movement of Meadow Pipits. The first indications of such a widespread arrival were in the early hours when 30 or so were found attracted to the lighthouse, which were roosted overnight before being ringed and released the next morning. During the delayed census the Island record count (which had stood at 924) was smashed with 1,420 counted-the vast majority of these moving through the fields and passing south out to sea over the south-eastern corner of the Island. The actual total would have been considerably higher (and quite likely double the recorded amount) as only a third of the Island was systematically covered, and we know there were plenty at the north end. Also today, what was presumably the same Citrine Wagtail was at Bridesness again and the Rosefinch continues to linger in the crop at Kirbest, while the only 'new' passerines were a single Robin and Lapland Bunting. There were 12 Ruffs in the fields near Holland House, 6 Black-tailed Godwits passed through and a Green Sandpiper on the scrape at Kirbest. The most eagerly anticipated month in Northern Isles birding began with a complete washout-literally!! Torrential rain all-day made birding almost impossible, with checks of the Islands Loch's all that was really manageable. The Pectoral Sandpiper was still at Gretchen, with a lingering Green Sandpiper at Kirbest, 2 Ruff and 2 Black-tailed Godwits the other notable waders. There was another arrival of wildfowl with 165 each of Wigeon and Teal, 12 Shovelers and 6 Pintails counted. A Sooty Shearwater passed by on the sea and a couple of Willow Warblers sought shelter in Holland gardens.